A $250 security deposit is required with this reservation and we will process a credit card authorization in that amount one week prior to your arrival. This is an authorization only and no charges will be made unless there is damage to the condo or contents, missing contents, excessive cleaning required after checkout or for exceeding the maximum number of overnight guests. Each missing towel and key will result in a $25 charge. Smoking is strictly prohibited in the condo or on the condo lanai and doing so will result in full loss of security deposit. No pets of any kind are allowed. Check-in time is 3 PM and check-out time is 11 AM. Please be certain to plan your arrival and departures days accordingly. If you require a late check-out, please contact the owner prior to your trip. The reservation deposit is nonrefundable; however if a cancellation is made more than 60 days prior to the check-in date, the full reservation deposit may be applied to a new set of reservation dates in the same condo beginning anytime up to one year from the original check-in date (subject to availability). Cancellation made within 30 days of the check-in date results in loss of all payments. All prices are quoted in US dollars. This unit is very modern, clean, &amp; beautifully laid out. The views from the lanai are amazing, especially at night.The condo comes well equipped with everything you need..The towels in the bathroom are plush &amp; thick. The bed is very comfortable. The kitchen is very well stocked &amp; beautiful with granite counter-tops &amp; high quality stainless appliances. The owner was very nice &amp; accommodating. We enjoyed our stay here &amp; highly recommend this unit to anyone. Beautifully appointed 500 sq ft condo with spectacular ocean view. Completely custom-renovated and designer decorated. Top-end finishes throughout (crown moldings, granite countertops, solid maple cabinets, travertine floor). Suitable for longterm stays. Minimum 3 night stay. Please contact owner with special requests. Prices are subject to change without prior notice. Amazing views of the ocean, harbor, and Ala Moana Beach Park. Enjoy your dinner on the lanai while watching the sunset. 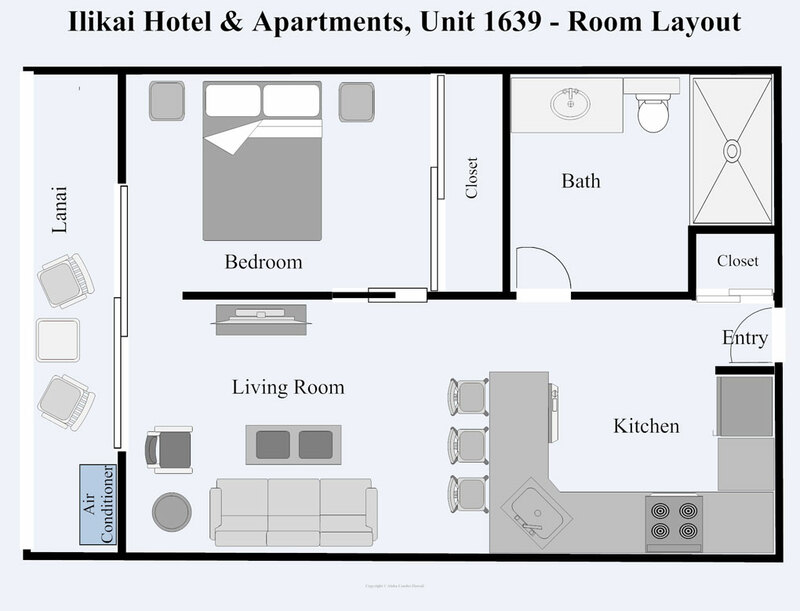 Spacious 120 sq ft lanai. Relax with your favorite cocktail and watch the waves roll in. Enter the entry code to open the door. Queen sleeper sofa, 32 inch flat-panel TV with cable, DVD player, quiet A/C unit, Wi-Fi. Fully equipped kitchen with granite countertop: stainless appliances (free-standing stove and oven, microwave, full-sized fridge with ice-maker), dinnerware, cookware, utensils, coffee-maker, toaster, blender, rice-cooker, ironing board, iron, extra folding bar stool. Laundry facilities located on the same floor, near the elevators. Coin-operated. Relax in the king size bed and look out at the ocean. Organic cotton coverlet and euroshams. 400+ thread count hotel white bedsheets. Plenty of storage space for luggage and personal items in extra wide closet with built-in shelves. Black-out curtains. Granite countertop, glass shower doors, adjustable hand-held shower head, hair dryer. Full towel sets and beach towels in linen closet. 20 minutes drive from airport, 10 minutes walk to Ala Moana Shopping Mall, 5 minutes walk to beach. Next to the Hilton Hawaiian Village which hosts a free fireworks display on Friday evenings. I want to keep this a secret !!! We were delighted with this condo and would love to brag about it but it could come back to "bite us" because you will all want to stay here too and there are only so many weeks in the year, LOL. Seriously, a fantastic little one bedroom condo with lovely accommodations. It is updated, clean and in a lovely location that you will love. We have stayed in other condos at the Ilikai and this is now our favorite. Kudos to our gracious hostess, Helen.Mahalo, Debbie and Tom OBrien. Fantastic one BR with an amazing view. This condo has everything you would want. The sofa bed was quite comfortable and the condo access was very easy. Kitchen is fully loaded, even though we ate out for the week we were there. Five stars. This is the second time I've stayed at the Ilikai with Aloha condos. This time at 1639. It was wonderful. I love the fact there is no check in hassle and no swipe cards for access to units, you just arrive and use your 4 digit code. Well appointed kitchen and FANTASTIC views. Comfortable bed and good shower. Host was very responsive and quick to sort out my TV issues. The Ilikai has an ABC store, coffee shop, restaurant and large spaces just to sit in the shade. Highly recommend, I will be back.